Breakfast is the most important meal of the day, so make time for it and you will function more efficiently throughout the day. My beautiful, traditional mother took a lot of effort to feed the family hot, fresh and highly nutritious breakfast. We were served home-cooked beans with yoghurt (also homemade) and wholegrain roti almost every day, except on weekends, when we ate usual Indian dishes (such as upma, poha, paratha and idli). My mother has been very clever when it came to feeding us. She is no nutritionist, but she has a superb knowledge of nutrition and its implementation in everyday living. Very early on she discovered that eating protein for breakfast is good for you. Growing up in India, one could not think of eating meat for breakfast or for that matter eating meat every day. Couple of exceptions being the fisherman community and the region of West Bengal, where fish is considered just another vegetable. Which is why she fed us various beans (such as mung, garbanzo, black-eye, green gram), and lentils for breakfast. Lentils/Beans are a great source of protein, especially for vegetarians. And a high protein breakfast helps to wake up your brain. There are many other reasons to love lentils and beans. They are a rich source of dietary fiber and therefore provide you slow releasing energy and keep you feeling full for longer. Just 1/2 a cup really fills you up. Lentils also provide good amounts of B vitamins, iron, copper, phosphorous, magnesium, iron, zinc and potassium. Additionally, protein-fiber rich breakfast is a great way to kick-start your metabolism, decrease fat deposits and help reduce food cravings. 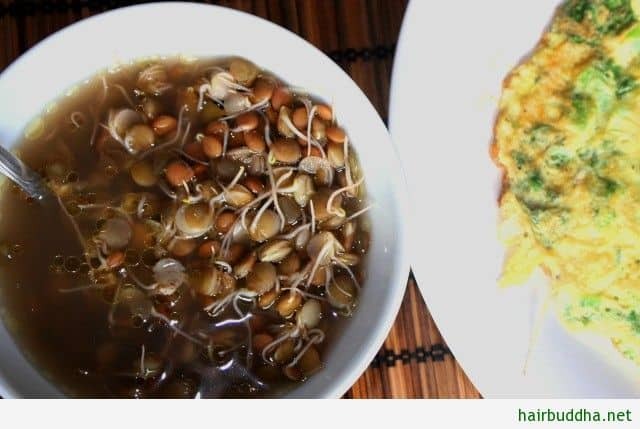 How to Cook Beans and Lentils? As they say old habits die-hard, I still continue to eat beans and lentils for breakfast and I absolutely love it. I can’t replicate what my mother fed us, as it requires time and effort. I can’t make roti and paratha in the morning and I can’t substitute these for bread because (a) yeast and me don’t go together, and (b) I don’t like the yeast free options such as rye crackers and soda bread. I have my own version – which is simple and easy. For the mornings I choose fast-to-cook beans/lentils such as mung beans, moth beans, black-eye beans, brown lentils, or green lentils. You need to pre-soak them overnight. You cannot not pre-soak them as they contain anti-nutrients and gas-causing enzymes – and these can be eliminated by soaking (learn more). (Please buy the actual seeds and not the canned ones as, in my opinion, they are not good for your health). Before we begin, one thing that you must have if you want to make beans and lentils a part of your everyday diet is a pressure cooker. This amazing gadget will make cooking so much easier – be it lentils, beans, meat or rice. I cannot do without a pressure cooker – I have 3 of them (of various shapes and sizes). Note: You don’t need to pressure cook mung or moth beans. They cook pretty quickly in a pot. This is very simple to make. Pressure cook your choice of beans or lentils for a couple of whistles. Let the steam go out fully before you open the cooker lid. The quantity of water will depend on whether you like to eat them dry or soupy. I like them soupy, so I add about 1 cup of water to 1/2 cup of beans. To Serve: Take the contents out in a bowl, add some butter and salt and you are ready to eat. I enjoy this with a boiled egg or omelet. I usually make this version on a weekend. Follow recipe 1 to cook the beans. In a pan add 1tsp of butter, when butter melts completely add one finely chopped spring onion. Saute for couple of minutes, then add 1/2 cup chopped tomatoes, 1 cup cooked beans/lentils, 1/4 tsp turmeric powder, 1/4 tsp pepper powder, 1/4 tsp chilli powder and salt to taste. Cook for another 2 to 3 minutes, covered. Serve hot. Where to buy: You will find them in any supermarket/grocery store or you can also purchase them online . They can be stored in your kitchen cabinets for months, so you don’t have to worry about them going bad. 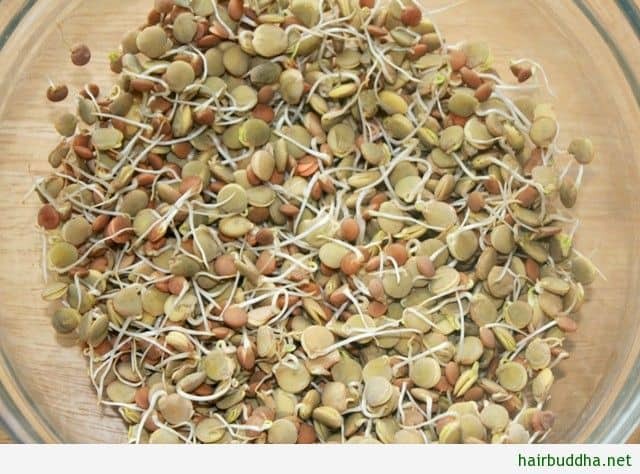 If you are a beginner, I would suggest that you start with one of these: mung beans, black eye beans, or green lentils. Most people find them palatable, plus they are easy to soak, sprout as well as cook. Do you eat lentils for breakfast? How do you cook them? Got any other breakfast ideas…. please share them in the comment box below. Just a correction, even Bengali’s who consider fish as essential part of diet, do not eat fishes in breakfast …. That’s superb, Sheetal! Thanks for sharing.